Some of us think we will suddenly be ready when Ramadan starts, but planning will make the transition a lot easier. 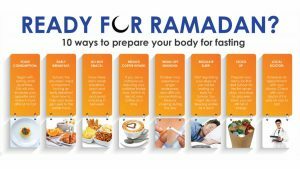 The following are 10 ways to prepare your body for the month of fasting. Food consumption: Begin with eating moderate quantities. Do not splurge on food because Ramadan is approaching. This will only increase your appetite and make it more difficult to fast. Do not snack: Get used to having three main meals – breakfast, lunch and dinner – and avoiding snacking in between. During Ramadan, you will have to get used to having two main meals, Suhoor and Iftar. This way, you will only have to cut out one meal. Reduce coffee intake: If you are a coffee-lover and do not want to have a pounding headache during the first few days of Ramadan, start reducing your caffeine intake now. Switch to decaf, one coffee at a time, until you are only drinking decaffeinated coffee, then cut it out altogether. 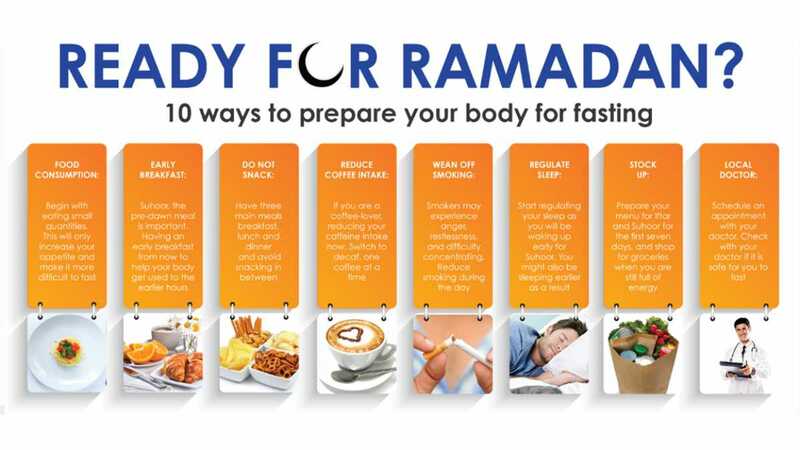 Wean off smoking: Smokers who enter Ramadan unprepared may experience various withdrawal symptoms such as irritability, anger, restlessness, impatience, and difficulty concentrating during fasting hours. To avoid this, reduce smoking during the day to mimic what will happen when you fast. It is also good to view Ramadan as an opportunity to quit bad habits such as smoking altogether. Voluntary fast days: What better way to prepare yourself for Ramadan than through practice? Try doing a few fasts in the run up to Ramadan to help you adapt. This is also a great opportunity to make up for any missed fasts from last year. Stock up: Meal-planning before Ramadan can save you a lot of hassle, especially during the first week of Ramadan while you are busy adjusting. Prepare your menu for Iftar and Suhoor for the first seven days, list the ingredients needed, and go grocery shopping now when you are still full of energy. Local doctor: If you have concerns over your ability to fast for whatever reason, be it diabetes, high blood pressure or reflux, now is the time to schedule an appointment with your doctor. Check with your doctor if it is safe for you to fast.